Licensed Battlefield Guide Stuart Dempsey is our host for this series on the 16th Michigan Infantry. To contact Stuart Dempsey, click here to reveal his email address. 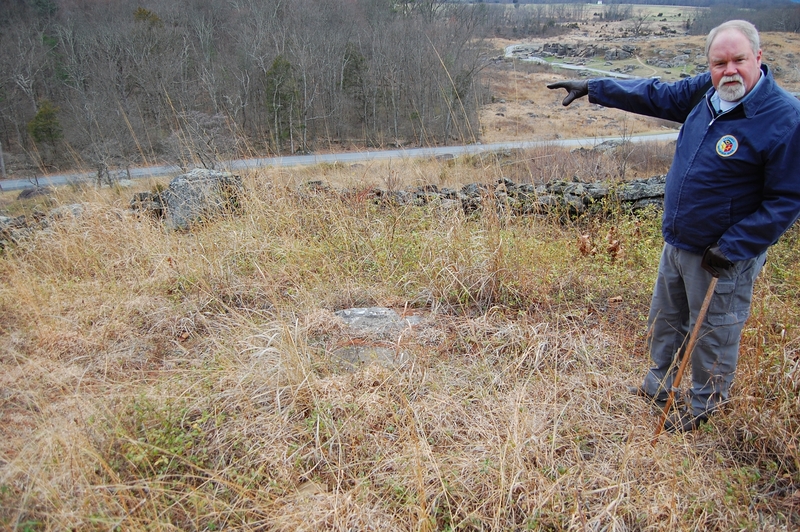 In addition to tours at Gettysburg National Military Park, Stuart also conducts tours at other historic sites in North America and Europe. He invites you to have a look at his website: www.battlegroundhistorytours.com.The 16th Michigan’s monument on Little Round Top. This view was taken facing south at approximately 10:30 AM on Wednesday, March 29, 2017. A map showing the location of Videos #7-8. This map also shows the original location and the current location of the 16th Michigan Infantry’s monument on Little Round Top. 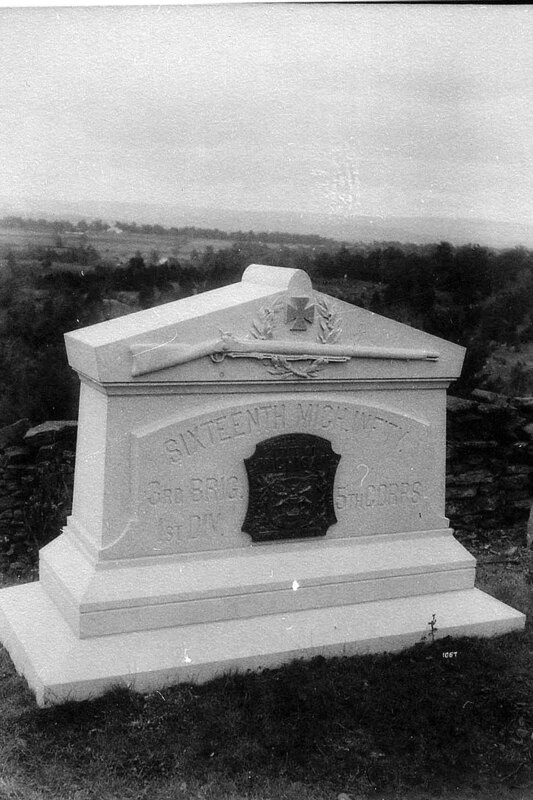 Previous posts in our series on the 16th Michigan: Part 1 [the regiment’s history prior to Gettysburg and its arrival at Power’s Hill], Part 2 [the 16th Michigan’s initial deployment on the left of the line at Little Round Top], and Part 3 [the 16th Michigan’s defense of Little Round Top and the collapse of their right flank].This map was created in a chair facing east on April 17, 2017. This map from Phil Laino’s Gettysburg Campaign Atlas shows the position of the 16th Michigan on the brigade right, prior the arrival of the 140th New York (top right). 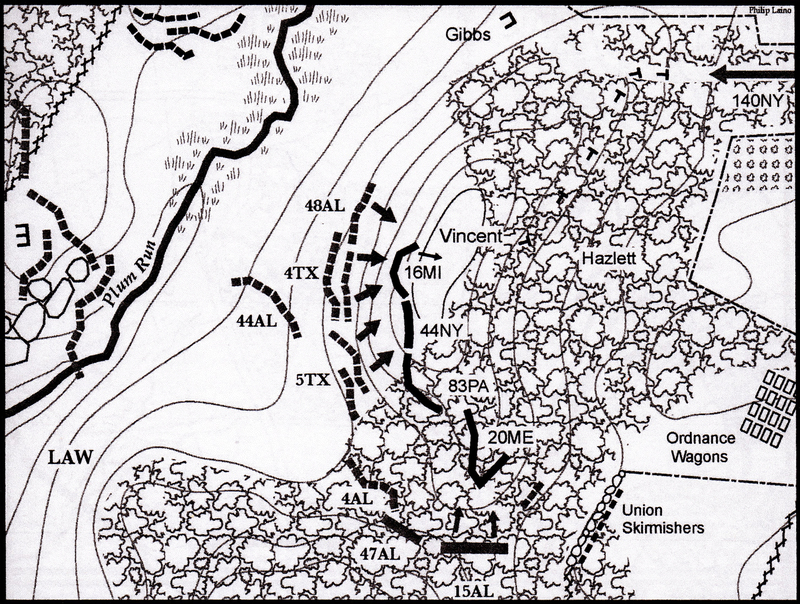 This map represents the position of regiments on Little Round Top at approximately 5:30 to 5:45 PM. This map was used with the permission of Phil Laino and appears in his Gettysburg Campaign Atlas. Video #7: Stuart describes the rescue of 16th Michigan by the 140th New York.This video was taken at approximately 10:30 AM on Wednesday, March 29, 2017. The 140th New York monument can be seen in the center-right background. Stuart is standing at the right flank marker to the 16th Michigan. The 44th New York Infantry monument is in the right background.This view was taken facing west at approximately 10:30 AM on Wednesday, March 29, 2017. 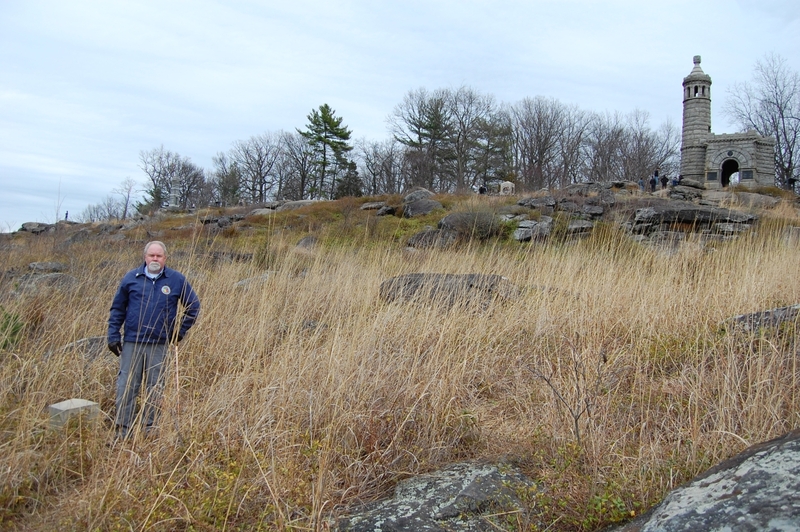 Stuart is showing us the original position of the 16th Michigan’s monument on Little Round Top. You can see the original foundation stones for the monument in the center of this photograph. The monument was moved to a more visually prominent position on the boulder shown in the first photograph in this post.This view was taken facing west at approximately 10:30 AM on Wednesday, March 29, 2017. 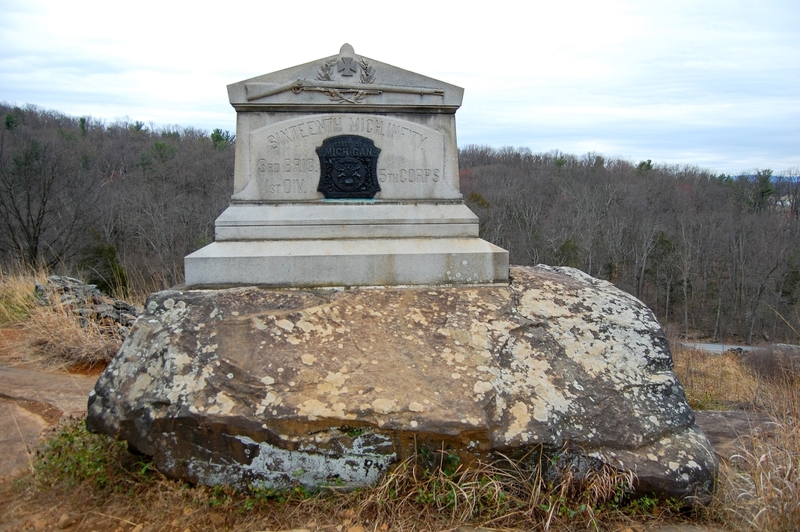 The 16th Michigan Infantry monument in its original location on Little Round Top.This view was taken by William H. Tipton circa 1889 [GNMP]. Video #8: The 16th Michigan on the evening of July 2nd, the morning of July 3rd, and during the rest of the Civil War.This video was taken at approximately 10:30 AM on Wednesday, March 29, 2017.